Webcasting refers to both live and on-demand delivery of digital media over Internet. In a live webcast, your audience watches your presentation unfold in realtime. An on-demand webcast is one where the files are uploaded and the audience views at their own convenience. We are able to provide both types of service. The critical link in any live webcast is the so-called 'uplink' between the theatre where the presentation is being recorded and the public Internet. 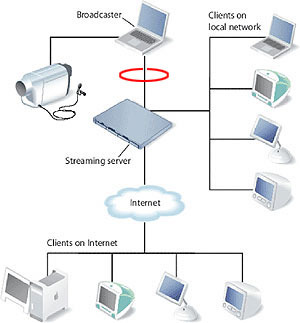 In the illustration at right, this is hightlighted with a red circle on the line between the 'broadcaster' and the 'streaming server'. This link carries the transmission to our servers and all the viewers access from that point. The load on this uplink is not high, in fact the streaming server has to bear hundreds of times more traffic, but if our uplink fails for any reason, all the viewers will be disconnected. For in-house events we can often make use of the corporate network for this uplink. If there is no existing link that can be tapped, we can use a 3G mobile network. But if one needs to ensure a failsafe connection it is best to install a dedicated line for the duration of the webcast event. And don't forget, if you are producing a live webcast, you still need to provision for on-demand use, because as many as 70% of the potential audience won't tune in during the live transmission. This is especially true if your audience is spread across several timezones. Live webcast transmissions consume a lot of network resources and require advance planning to execute well. When planning a live webcast event, these are some of the questions that you should be asking yourself. Where is the audience located? If the audience is inside your corporate network, then we must use that network to uplink the live transmission. If most of the audience is outside your corporate network, we can host on our own servers. Will viewer access be restricted? If access is limited to your corporate staff, you don't have much to worry about. But if you host your webcast externally, you may want to implement registration to limit unauthorised access. Will your audience have unusual bandwidth constraints? These days we generally transmit broadband video, which is easily viewed in USA, Europe, and well-developed Asian countries like Singapore, Malaysia, Japan and South Korea. However if part of your audience is in China, Indonesia or India, you may want to also offer low bitrate options such as audio only or audio with slides. Do you need audience feedback during the webcast? We suggest that you use existing channels such as instant messaging or email to facilitate communication with a programme moderator (not to the speaker). But if you prefer, we can customise the player so that audience members can send their feedback to the moderator without changing applications. We can handle very large audiences because we host our webcasts not on a single streaming server (as in the illustration above) but on a distributed network of servers custom built for concerts, political campaigns and other large-scale events. This is known as a content delivery network or 'CDN'. The service charges for producing webcasts are typically built into the cost of presentation recording, but you need to also consider the hosting costs, which are based on data traffic. Please refer to our page on video hosting services for more information on these charges.